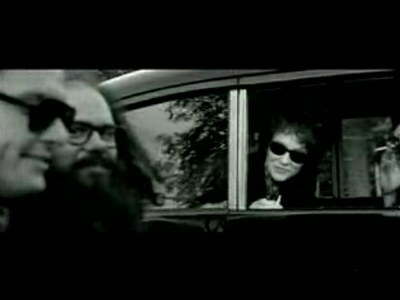 Director Todd Hayne’s film “I’m Not There” which is an unusual look at the life of Bob Dylan has opened. You can read past cafe blog entries (including preview clips) of the film here. In the Hayne’s film, I’m Not There, Bob Dylan is portrayed by six different actors playing seven different Dylans. The clips are dispersed and are not linear. There are elements of this film that are just extraordinary, especially the visual narrative, the photography, the composition of the scenes and set design, costume, and lighting – truly remarkable, but in my opinion, tonight, it misses the mark almost completely – but the fact that it misses the mark is precisely why Dylan remains a substantial figure in American music – and American culture – today. There is a scene in the film where we are looking down on the Dylan portrayed by actress Cate Blanchett called “Jude.” Jude is sitting on the floor in front of a typewriter surround by cutouts from magazines of pictures and stories and they are spread all around the floor as Dylan – I mean Jude – is typing. It’s a terrific shot and one that really explains what makes this film great – and what makes this film fly off the rails. Haynes has filmed interpretations of the elements that marks Dylan’s life and he’s filmed them brilliantly, but where he misses the mark is that he completely misses the point of Dylan’s life. no small deal! It’s not his political contribution or his struggle with his political identity or anything really having to do with politics. He made that quite clear when he gave a speech to the the Emergency Civil Liberties Committee in 1964. His journey isn’t political – it’s spiritual. The spiritual aspect – though touched on briefly but without any context, as though they might have actually been reporting that Dylan left briefly to go live on Mars – is just completely missing. The “cutouts” are there, but the context is missing. Because the film is so brilliantly filmed, what I want to do is take all the elements that Haynes has put together, spread them all out on the floor as Blanchett’s Dylan does and start over. And that may be why the film is good – it’s an accurate portrait of one way (told from seven points of view) but still only one way to look at Dylan. All that work and it’s still on dimensional. It misses the mark because it’s not seven points of view of seven different realities – hence, six different actors playing seven different Dylans. There is only one reality to Bob Dylan – life and death, or as he put it better “he who is not busy being born is busy dying.” Over and over again throughout Dylan’s music – from the very beginning – is this spiritual journey of biblical proportions. He is a pilgrim on the trail, he is a modern Pilgrim’s Progress. As in Pilgrim’s Progress he goes to many lands – including perhaps more than one Slough of Despond – but he is one pilgrim on a journey. One way we know this to be true and that Haynes has completely – though ironically almost brilliantly – missed the point is that no where in this film (as I can recall, and please correct me if I’m wrong) do we see Johnny Cash. There is no excuse that anyone can tell the story of Bob Dylan – even in an arthouse film – and leave that man out. It’s just impossible. And it reveals that, though perhaps he tried hard, Haynes still missed the point. Cash comes in early (we see him in Don’t Look Back in 1966, but he had come into Dylan’s life years earlier, at least at one of the Newport Folk Festivals where stories are told that after one of Dylan’s early performances at Newport Johnny Cash gave him his own guitar. To tell a story – even a edgy one like Haynes story – and leave out Cash may say more about the filmmaker than it does about the subject. The elements do appear in the film – however briefly, including the scene from the never-released in the US Dylan film, Renaldo and Clara, where Dylan and Ginsberg go to visit Jack Kerouac’s grave and wander about looking at the other gravestones, including one that is a crucifix of Christ. The scene of Ginsberg and Dylan standing at the foot of the crucifix is in the film, but it lacks context. In fact, it’s the character of Ginsberg that actually moves the scene more than Dylan (who flippantly asks, “How does it feel?”), Ginsberg’s response to the looking at the cross appears far more poignant and then the flippant Dylan. That’s not how it appears in the original film and the almost switching of subjects in Haynes film is perhaps inadvertently quite telling. “I’m Not There” is the sort of film that Dylan fans can watch and then go out afterward and take apart over drinks. It’s a remarkable film, very well done, filled with imagery and an extraordinary accurate feel of time and place, especially in the Jude scenes and the earlier “Woody/Dylan” scenes. In fact, the actor playing Woody basically steals the entire film, which is quite a feat for someone so young. The line about “Zimdom” was actually spoken by John Lennon in the famous “taxi ride” film that appeared at the end of another never-officially-released Dylan film, Eat the Document. Haynes comes close to what could have been the real theme of the film (not this film though): Dylan’s quest for salvation. I do not agree with the Haynes view of Dylan, which basically ends almost on the road (or riding the rail) of despair. It misses his humor and replaces it was biting sarcasm (Dylan could be sarcastic, but usually for a reason – as in exposing hypocrisy, even his own). And the spiritual element, the spiritual depth of Dylan’s music is just completely ignored in the narrative (though the music is present in the soundtrack which at times is almost a separate narrative all itself and the selections are terrific). This could be the view of the almost-fan, who knows a lot about the particulars of Dylan but doesn’t quite get it yet – has not yet gone deeper into the soul but is still fascinated by the look, even the feeling – but not the transformation. Dylan is all about transformation. Haynes assembles all the ingredients – and it does it extremely well – but he seem doesn’t seem to know how to mix them together to make the pie. And he leaves some key ingredients out. It might good but it doesn’t taste so hot. There are moments – moments that nearly tease us that he may “go there” but then doesn’t. When the Woody/Dylan is in the boxcar with the two old guys riding the rails they share a loaf of bread which they pass around amongst themselves, tearing each piece off as though it was the Eucharist. But the image doesn’t go anywhere. Which again, is one of the reasons I wish I could get all the pieces of the film and re-edit the parts. But again, that’s why Bob Dylan continues to be such a force in American music and culture. We all continue to try to splice it together and figure out the whole. He won’t tell us a darn thing – he says it’s in the songs. He finds his religion in the songs. Perhaps he finds his salvation in the songs – in my circles that’s called worship. Dylan is about being a Truth teller. Not different truths – which is sort of what this post-modern view of Dylan attempts to do. Dylan will write that there are different points of view, but there is only Truth – not your truth or my truth or his truth, but just Truth. His fidelity to seeking the Truth, no matter where it might take him, even if he takes a path that leads through thicket of thorns, he will – and does – keep on going. But that journey, the Truth Seeker’s journey is missing from this film. It’s aimless, which perhaps many of those who seek after Dylan to explain the meaning of life are at times, but Dylan is not – at least, not in his music. It’s precisely because he’s not been aimless that has gotten him booed at over the years. Another crucial aspect of Dylan’s music and persona has been his humor, which again does not come through in the film. We see earnestness in the beginning in the Woody character, but we never see his deadpan wit. We see sarcasm, plenty of sarcasm – but not his humor which continues even to this day (“I’m no pig without a wig, hope you’ll treat me kind”). While the film fortunately does not take itself – or even Dylan – too seriously (in fact, there are times when I wondered if the film itself was drifting into satire or even parody – an example of this was during the Scorsesesque-interviews” with Julianne Moore portraying the Joan Baez character. I thought they were very funny precisely because they seemed satirical of Baez (nearly unheard of in the liberal community where she continues to be revered) and it was all I could do to not laugh out loud because the audience where I saw the film was in silence and I would have laughed alone, perhaps not wise when one does not know the politics of everyone around her). Haynes is GenX – he films as knows the stories not by living them, but by reading about them. So here’s the real deal – this Dylan is seen a lot in Todd Haynes’ film and we might as well see the real deal here. Since he’s still with us, I’ll stick with seeing the real deal. Even when he’s in a bad mood. LATER: Here’s a very positive review of the film and well-worth the read. Thanks Baby Blue for your interest in Dylan. His Gospel music has always been ignored by the liberal press, but is too powerful to be ignored by history. The Church would do well to listen to him and as you said—his worship.Thanks for your review of the film. The film says more of what our time wants Dylan to be, rather than who Dylan is in his totality—a pilgrim on the road to Salvation. Please keep commenting on him.Have you ever thought about commenting on Garrison Keillor. He recently wrote of his experience in attending a Mass at an Anglo-Catholic parish. It was quite touching to read.